Use our free gift certificate maker to edit any of the gift certificates on this site. 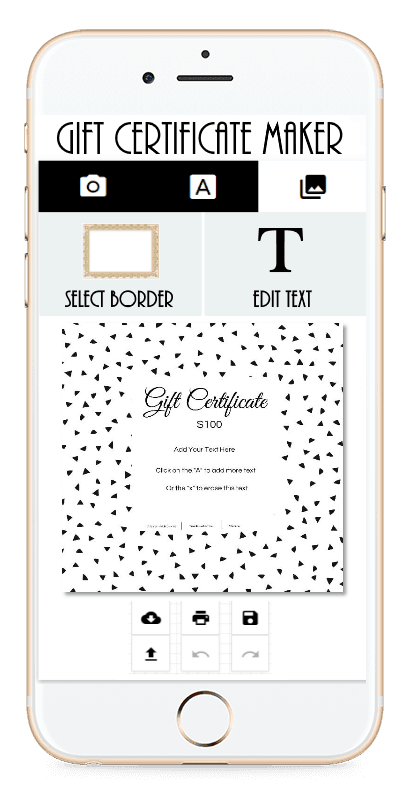 Select any free customizable gift certificate template from this site and edit the text. You can also erase the text to create a blank gift certificate if you prefer to add a handwritten message. There are 101 different gift certificate templates available. Edit all text. You can also add additional text. Add your company logo and/or image. You can save, download or print the gift certificate. Open the online gift certificate generator and select a template from 101 different options. If you prefer to use your own background then you can erase the background and upload your own photo or just start from scratch with no background. For example, if you are making a gift certificate for a store then you can upload a photo of the store or of any of your products. Open the diy gift certificate maker and you will see various backgrounds. If you don’t see them then click on “select background”. Select a category and then click on a template. It will then appear on your background. You can erase the text, add additional text or edit the dummy text. You can also change the font and the size. To add a logo, click on “add image”. To create a business gift certificate you might want to add a QR code. To so this, click on the QR code icon and enter your text or URL. You can then move the code to wherever you want it to appear. You can also make it bigger or smaller. Step 5: Download and print. Print your custom gift certificates at home or have them printed at your local office supplies store.